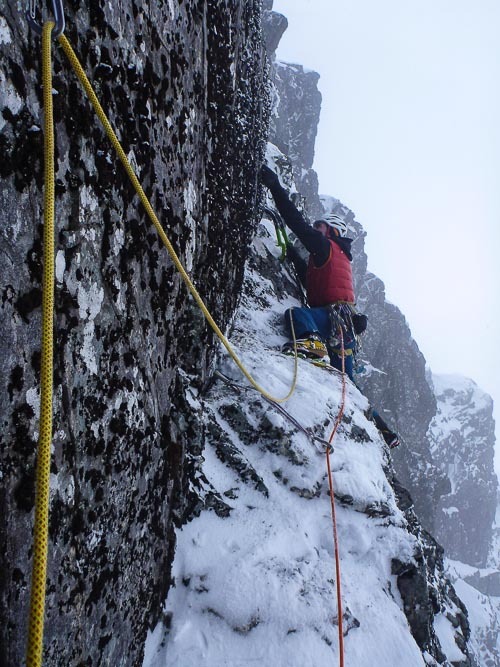 “Dave MacLeod and I headed up the Ben last Sunday (March 5),” Helen Rennard writes. “We had been thinking of climbing something up in Coire na Ciste and Dave had kindly offered to belay me on something (I tend to go into seconding mode when climbing with him) but it was looking too black. After an hour or two of drinking tea in the hut – our usual routine when we go up the Ben, which always results in us finishing in the dark – we headed up Observatory Gully to have a look at another new route. The East Flank of Tower Ridge, and higher up by Tower Scoop, are areas that hold conditions later in the season and we’ve climbed new routes up there at this time of year for the last three years, all in February or March. On Sunday we did a new line left of Red Dragon (which we climbed in 2015), taking a leftward slanting ramp to a short very steep wall (crux). Dave had an exciting time leading this as he hooked a loose block pulling through the crux. He managed to downclimb without it coming off, then went back up again to pull it off in a relatively controlled manner (i.e. it just missed his face). Pitch two traversed off to the right before joining the higher part of Red Dragon above. The traverse looked straightforward but was sketchy and technical. We came across some old gear on the route, on the first pitch and at the first belay, and wondered whether this was from a previous attempt or from folk abbing off Tower Ridge. It turned out it belonged to Pete Davies (who I was out with the following day) and Tim Marsh who had tried the line twice about five years ago. Their high point had been the start of the traverse on pitch two. They had bypassed the crux wall by going round it to the left. We called the route Cloudjumper (another dragon name – Dave wasn’t up for my suggestion of Puff the Magic Dragon) and gave it VIII,9. This entry was posted in New Routes and tagged Ben Nevis, Dave MacLeod, Helen Rennard. Bookmark the permalink.